Sony a7S Full-Frame Mirrorless Camera, Part 3: Video Camera Review – Vancouver Video Production Company – Shawn Lam Video Inc. In the last two articles in this 3-part series on the Sony a7S, we covered a lot of ground discussing what to look for in video lenses and lens adapters for the Sony e-mount that is native to the Sony a7S. Now it is time to take a deeper look at the Sony a7S as a video camera, with comparisons to the Canon 5D MKIII and Panasonic DMC-GH4. In any camera review it’s always helpful to compare a camera to a similar one, but in this regard, the Sony α7S is without direct peers. On the Canon front it would seem logical to compare the Sony α7S to the 5D MKIII because they’re both full-frame cameras, but this wouldn’t be a fair video test for Canon because the 5D MKIII is a photo DSLR with a 22.3MP full-frame sensor that isn’t as ideally suited for video use as is the Sony α7S’ 12MP video sensor. A more fair comparison for the 5D MKIII would be the Sony α7 with its 24.3MP sensor that sells for less than half the cost of the MKIII. On the Panasonic front, it might seem logical to some to compare the Sony α7S to the Panasonic Lumix DMC-GH4 because the GH4 can record 4K internally, while the Sony α7S can output 8-bit 4K UHD live from its micro-HDMI port. And while internal 4K recording and external 4K HDMI output are very different features, the bigger difference between the GH4 and the Sony α7S lies in the size of their sensors. The GH4 has a micro four-thirds sensor and the Sony α7S has a full-frame sensor. When you use the GH4 in 4K UHD or 4K DCI mode, it means you’re filming with a 2.3x crop factor and the individual photosites on the sensor are 1/5 the size of ones on the Sony α7S. A smaller sensor and larger crop factor has two consequences: first, your depth of field at an equivalent focal length will be greater; and second, your focal length will be longer. To calculate the 35mm focal length that your lens and camera combination will produce, you have to multiply your lens focal length by the crop factor. For example, a 50mm prime lens becomes a 115mm telephoto lens on the GH4. 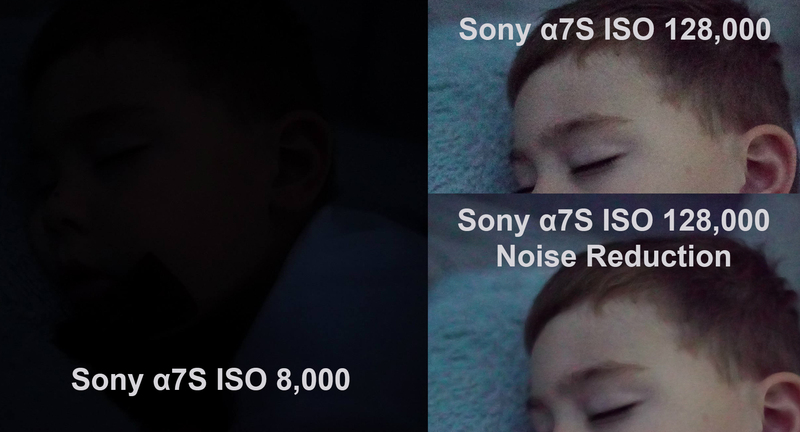 Ultimately, neither the Canon 5D MKIII nor the Panasonic GH4 can compete with the Sony α7S when it comes to low noise at high ISO values and a wide dynamic range. The Sony α7S is a low-light monster that produces usable video at ISO values of 102,400. This is huge when you consider that the GH4 image starts to fall apart and be very noisy at 1,600 ISO. Having access to a noise-free, high-ISO image means you can pick virtually any combination of shutter speed and f-stop without having to worry about balancing off high ISO noise. Ultimately, this can lead to more creative freedom and control of your image. As for dynamic range, Cinema5D lab tests show the Sony α7S can produce a 14.1 stop dynamic range when shooting with SLOG2, which is 2.3 stops wider than the 5D MKIII and 3.2 stops wider than the GH4. Having a wider dynamic range means you can discern more detail in shadows and highlights simultaneously. Filming on a wide dynamic range camera is also more forgiving. You still can’t overexpose your image and hope to recover detail in post, but the range that you can work in is so much wider so you don’t need to worry so much with nailing the exposure as you do with a camcorder that has a smaller dynamic range. The α7S lets you see in the dark well beyond what the human eye can. In this example, I took a photo of my son sleeping while camping. On the left is what I saw and on the right, what the α7S saw. Minolta Rokkor-x 50mm f.1.4 lens. I’m sure it’s only a matter of time before Sony releases a full-frame video camera with the same sensor as the α7S and adds in missing and important features like internal 4K recording, SLOG2 shooting with a monitor preview using a LUT, unlimited recording time, and XLR audio inputs. But until they do, the α7S is a camera without direct competition, while at the same time it competes with DSLRs and professional video cameras alike.